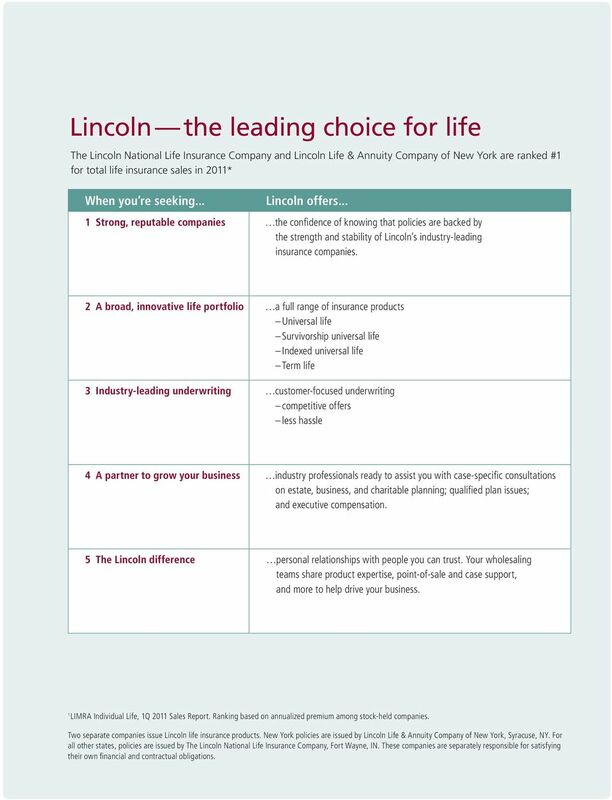 Download "Lincoln universal and term life insurance portfolio at-a-glance"
2 Lincoln the leading choice for life The Lincoln National Life Insurance Company and Lincoln Life & Annuity Company of New York are ranked #1 for total life insurance sales in 2011* When you re seeking... Lincoln offers... 1 Strong, reputable companies the confidence of knowing that policies are backed by the strength and stability of Lincoln s industry-leading insurance companies. 2 A broad, innovative life portfolio a full range of insurance products Universal life Survivorship universal life Indexed universal life Term life 3 Industry-leading underwriting customer-focused underwriting competitive offers less hassle 4 A partner to grow your business industry professionals ready to assist you with case-specific consultations on estate, business, and charitable planning; qualified plan issues; and executive compensation. 5 The Lincoln difference personal relationships with people you can trust. Your wholesaling teams share product expertise, point-of-sale and case support, and more to help drive your business. 1 LIMRA Individual Life, 1Q 2011 Sales Report. Ranking based on annualized premium among stock-held companies. Two separate companies issue Lincoln life insurance products. 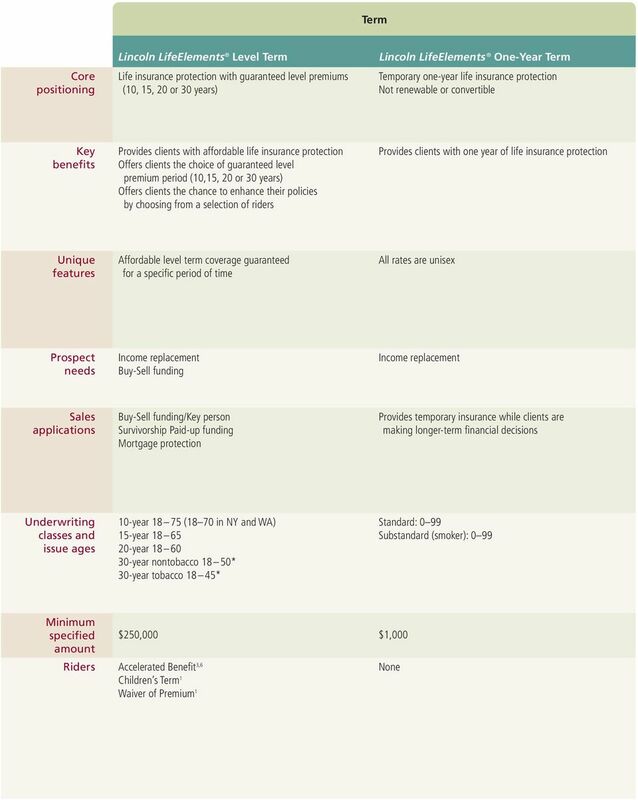 New York policies are issued by Lincoln Life & Annuity Company of New York, Syracuse, NY. For all other states, policies are issued by The Lincoln National Life Insurance Company, Fort Wayne, IN. These companies are separately responsible for satisfying their own financial and contractual obligations. 4 No-Lapse Guarantee Core positioning Lincoln LifeGuarantee UL Cost-efficient universal life insurance with a lifetime secondary guarantee Lincoln LifeGuarantee Plus UL Universal life insurance with a lifetime secondary guarantee and more policy value than Lincoln LifeGuarantee UL Key benefits Lets clients protect what s most important with a death benefit that can be guaranteed Offers guaranteed premiums Can provide clients with affordable lifetime guaranteed insurance coverage Lets clients protect what s most important with a death benefit that can be guaranteed Offers guaranteed premiums Allows clients to fund their policies so that they can build policy value over time Unique features Premium relief feature Guaranteed Issue availability 1035 exchange forgiveness feature Flex Option allows for a funding strategy to minimize initial premiums and pay higher premiums in the later years Higher cash value and guaranteed death benefit premiums than Lincoln LifeGuarantee UL Guaranteed Issue availability Premium relief feature 1035 exchange forgiveness feature Prospect needs Supplemental retirement income Sales applications Underwriting classes and issue ages Term vs. permanent Group life replacement Pension Max Lincoln LifeLINC (asset leverage) Key person Buy-Sell funding strategies Preferred nontobacco and tobacco Standard nontobacco and tobacco Simplified Issue: Guaranteed issue: SLAT/Private Value Access Term vs. permanent/rated Annuity Max Supplemental retirement income Key person Buy-Sell funding Preferred nontobacco and tobacco Standard nontobacco and tobacco Simplified Issue: Guaranteed Issue: 20 70* Minimum specified amount Riders $100,000 ($60,000 Guaranteed Issue) $100,000 ($60,000 Guaranteed Issue) Minimum Death Benefit Spouse Term 1,2 Accelerated Benefit (with Critical Illness) 2,3,6 Minimum Death Benefit Spouse Term 1,2 Accelerated Benefit (with Critical Illness) 2,3,6 Guarantees are backed by the claims-paying ability of the appropriate issuing company. 5 UL Lincoln DurationGuarantee UL Lincoln LifeGuarantee SUL Lincoln LifeCurrent UL Cost-efficient, guaranteed universal life insurance protection for durations of 10, 15, 20, 25 or 30 years or to age 95 Universal life insurance with a lifetime secondary death benefit guarantee on two lives, payable upon the second death Universal life insurance protection with a 20-year secondary death benefit guarantee plus significant policy value growth Shorter guaranteed duration coverage at older ages 1035 rollover capability for short duration guaranteed coverage at all ages A powerful tool for estate planning that can provide an affordable lifetime guaranteed death benefit to beneficiaries when the second of the two insureds dies Offers guaranteed premiums Provides valuable life insurance protection Provides clients with the ability to adjust premium payments and coverage amount over time to keep pace with their lives Provides significant policy value growth Premium relief feature and 1035 exchange forgiveness feature Premium relief feature 1035 exchange forgiveness feature Flex Option allows for a funding strategy to minimize initial premiums and pay higher premiums in the later years Coverage protection guarantee for the shorter of 20 years or to age 90 Premium relief feature Zero loan spread on nonguaranteed basis Business transition Estate tax planning Accumulation strategies ILIT, FLP Buy-Sell funding ILIT/Dynasty Trust Private Split Dollar/Premium financing Roth alternative Supplemental retirement Pay up survivorship Term vs. permanent/rated Annuity Max for older ages Key person/buy-sell funding Duration 10-yr. 15-yr. 20-yr. 25-yr. 30-yr. To age 95 Preferred nontobacco Standard nontobacco Standard tobacco Preferred plus & Preferred nontobacco and tobacco Standard nontobacco and tobacco Preferred nontobacco and tobacco Standard nontobacco and tobacco Simplified Issue: Guaranteed Issue: $100,000 ($60,000 Guaranteed Issue) $100,000 $100,000 Accelerated Benefit 2,3,5,6 Accelerated Benefit (with Critical Illness) 3,4,6 Disability Waiver Monthly Deductions 1 Minimum Death Benefit 4 Minimum Death Benefit Estate Protection 1,2 Policy Split Option 1 Accelerated Death Benefit (1st Death) 2,3,6 Accelerated Death Benefit (without 1st Death) 2,3,6 Spouse Term 1,2 Accelerated Benefit (with Critical Illness) 2,3,6 * Not all riders are available. 1 Available at an additional cost. 2 Not available in New York. 3 One-time charge applied when benefit is exercised. 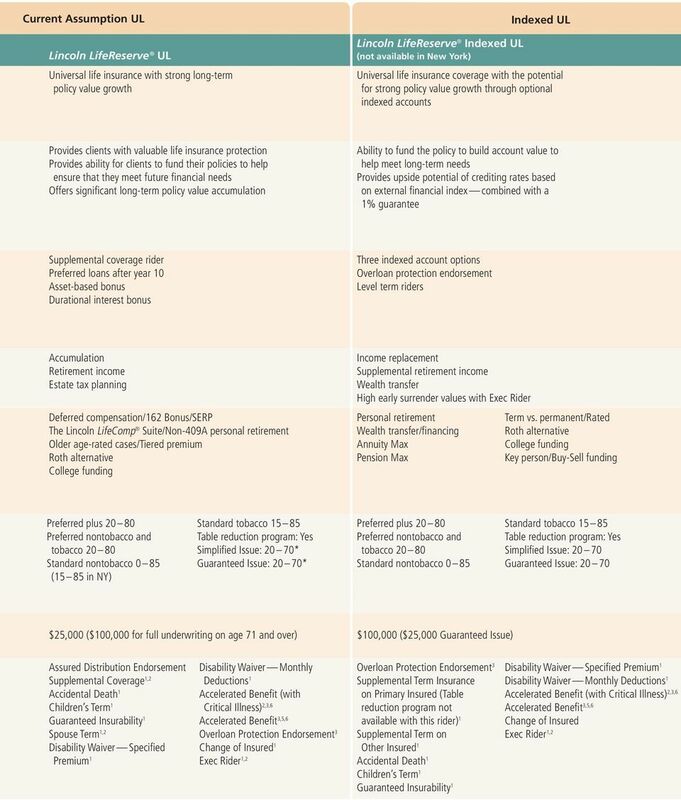 4 Not available in CT, MD, NJ, NY and PA. 5 Nursing home benefit not available in some states. 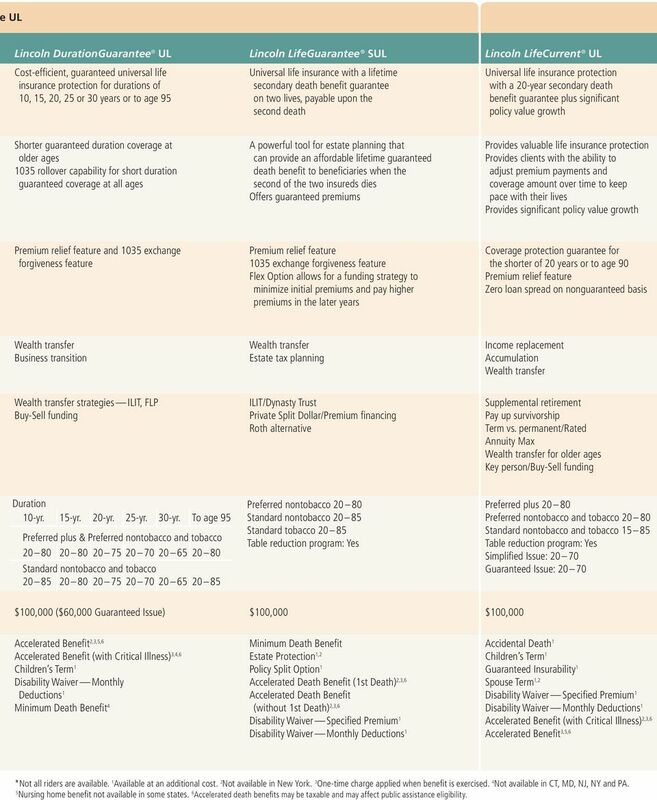 6 Accelerated death benefits may be taxable and may affect public assistance eligibility. 8 HELPING PEOPLE FACE THE FUTURE WITH CONFIDENCE At Lincoln Financial Group, we ve spent more than 100 years living up to the character of our namesake: integrity, honesty, and the belief in a better tomorrow. We provide advice and solutions to help people save for tomorrow, secure and maximize their income, protect themselves and their loved ones, and prepare for the unexpected. INCOME LIFE RETIREMENT GROUP BENEFITS Not a deposit Not FDIC-insured Not insured by any federal government agency Not guaranteed by any bank or savings association May go down in value 2011 Lincoln National Corporation Lincoln Financial Group is the marketing name for Lincoln National Corporation and its affiliates. Affiliates are separately responsible for their own financial and contractual obligations. LCN ECG 7/11 Z03 Order code: LIF-TERM-BRC008 This material was prepared to support the promotion and marketing of investment and insurance products. Lincoln Financial Group affiliates, their distributors, and their respective employees, representatives, and/ or insurance agents do not provide tax, accounting, or legal advice. Any tax statements contained herein were not intended or written to be used, and cannot be used, for the purpose of avoiding U.S. federal, state, or local tax penalties. Please consult your own independent advisor as to any tax, accounting, or legal statements made herein. 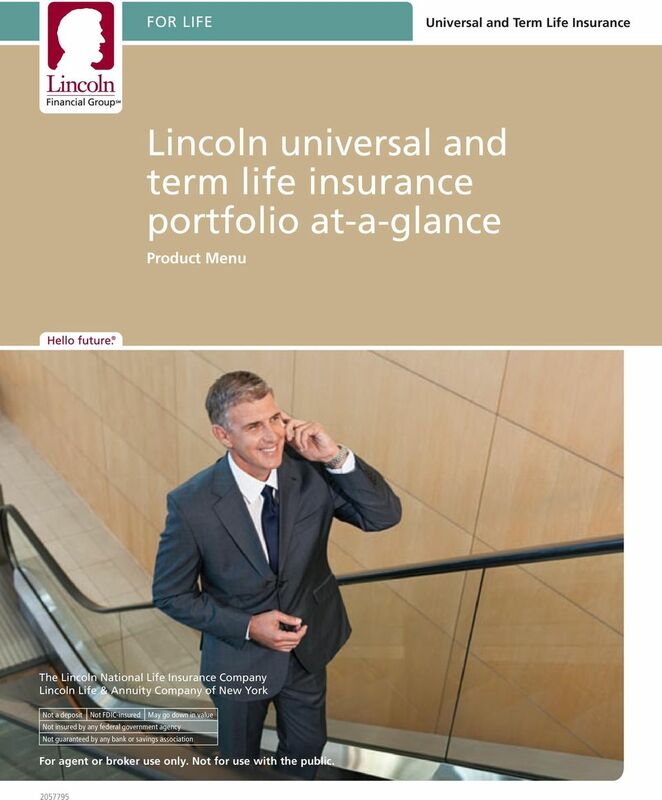 Lincoln LifeElements Level Term is issued on policy form TRM5065 and state variations; Lincoln LifeElements One-Year Term is issued on policy form LN485 and state variations by The Lincoln National Life Insurance Company, Fort Wayne, IN. The Lincoln National Life Insurance Company does not solicit business in the state of New York, nor is it authorized to do so. 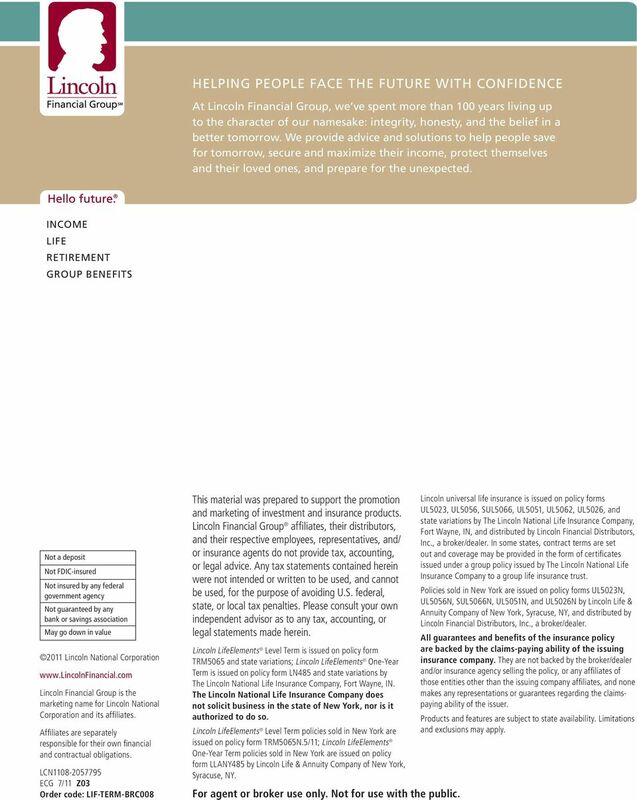 Lincoln LifeElements Level Term policies sold in New York are issued on policy form TRM5065N.5/11; Lincoln LifeElements One-Year Term policies sold in New York are issued on policy form LLANY485 by Lincoln Life & Annuity Company of New York, Syracuse, NY. For agent or broker use only. Not for use with the public. 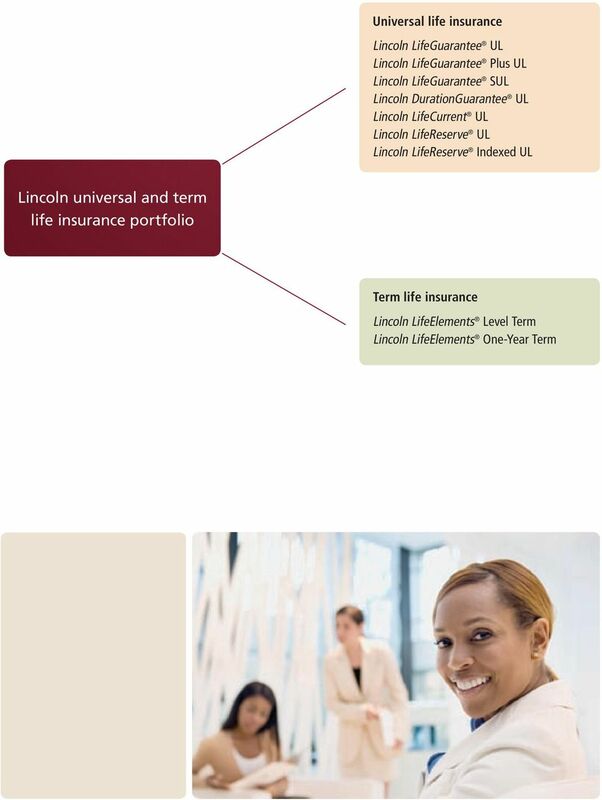 Lincoln universal life insurance is issued on policy forms UL5023, UL5056, SUL5066, UL5051, UL5062, UL5026, and state variations by The Lincoln National Life Insurance Company, Fort Wayne, IN, and distributed by Lincoln Financial Distributors, Inc., a broker/dealer. In some states, contract terms are set out and coverage may be provided in the form of certificates issued under a group policy issued by The Lincoln National Life Insurance Company to a group life insurance trust. 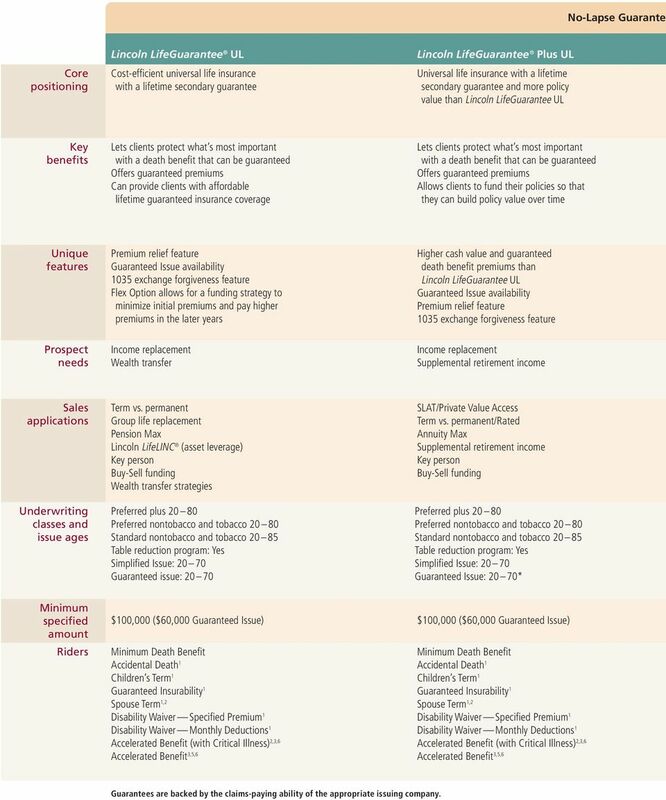 Policies sold in New York are issued on policy forms UL5023N, UL5056N, SUL5066N, UL5051N, and UL5026N by Lincoln Life & Annuity Company of New York, Syracuse, NY, and distributed by Lincoln Financial Distributors, Inc., a broker/dealer. All guarantees and benefits of the insurance policy are backed by the claims-paying ability of the issuing insurance company. They are not backed by the broker/dealer and/or insurance agency selling the policy, or any affiliates of those entities other than the issuing company affiliates, and none makes any representations or guarantees regarding the claimspaying ability of the issuer. Products and features are subject to state availability. Limitations and exclusions may apply.